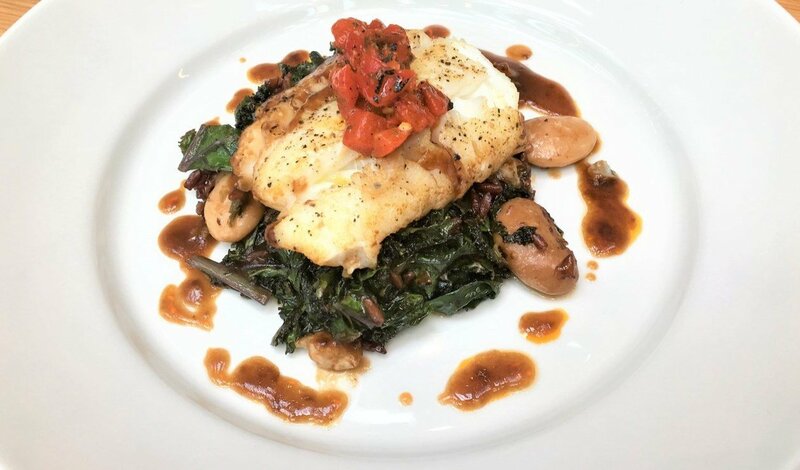 Tender, flaky cod is paired with a bold sauce and sautéed vegetables for a delightful combination of flavors and textures. Reduce the white wine by half. Add the prepared Knorr Demi Glace. Add the lemon zest. Season to taste and keep warm. Sauté the shallot and garlic in olive oil. Add the kale and continue to cook until the kale is wilted and beginning to brown. Add the beans and rice and continue to cook until warmed through. Add a small amount of the prepared demi glace to just barely coat the mixture. Season the cod with salt and pepper. Pan sear in olive oil on medium-high heat until golden brown. Turn the cod over and cook through until just opaque. Before removing from the pan, add a ladle of the prepared demi glace and baste the fish, if desired. Place a portion of the kale mixture on the plate. Top with the pan seared cod. Drizzle the demi glace around the plate. Top with 1 Tbsp of the roasted pepper tapenade.